I’m sure that all you wine lovers out there can point out scores (no pun intended) of connections between wine and music. Music is undoubtedly a lovely backdrop to enjoying a glass of wine. 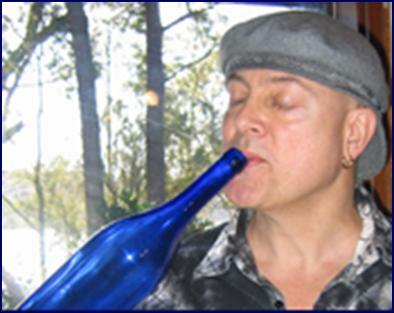 Wine has been mentioned in countless popular songs from “Red Red Wine” by UB40 to “Scenes from an Italian Restaurant” by Billy Joel (no, the name of the song is not “A Bottle of Red, A Bottle of White” so don’t test me.) Music has even been the inspiration for some wines, such as Arietta out of Napa Valley, arietta meaning a short aria. But did you ever expect wine to make music? Well, ponder the thought no more my friends. A musician from Australia — an acclaimed musician at that — is using wine barrels, bottles, glasses and corks to make music. Okay, so I use the term “music” lightly here but the composer (Tony King) did indeed record an album called, naturally, Wine Music. Looks like there is a new "king" in town -- and I think you'll be sorry that Elvis has left the building. How does King make this so-called music? Well, for starters he employs some age old tricks such as running his finger around the rim of a wine glass and blowing into wine bottles. The first “technique” strikes me as something I would teach my nieces at the dinner table to amuse them (ok, and me) and the second brings back memories of my Dad watching football and making unpleasant noises with his bottle of Black Label beer -- culture, culture, culture. Mr. King also incorporates the ever pleasing sounds of banging on wine barrels, turning and popping corks and tapping corkscrews against Champagne flutes. Don’t think for a minute that this isn’t all very well thought out. King even claims that "the richer, deeper sound (of a Bordeaux glass) seems to correlate to the taste of a Bordeaux. A Sauvignon Blanc glass has a more crisp sound." I have officially heard it all. You can check out the CD for yourself at soundofwine.net. I myself couldn’t resist and all I have to say is that if “music is the wine that fills the cup of silence” by all means bring me an empty glass! I have to agree. I also got the album and I really enjoy the music. It is meant to be heard as a whole and I listen to it more than any album on my ipod. It's also great at dinner parties. There is a movie on the website that explains how it was made. very cool indeed. Each to their own but if you like ethereal music you'll find it worth checking out. I also bought the Sound of Wine and loved it.